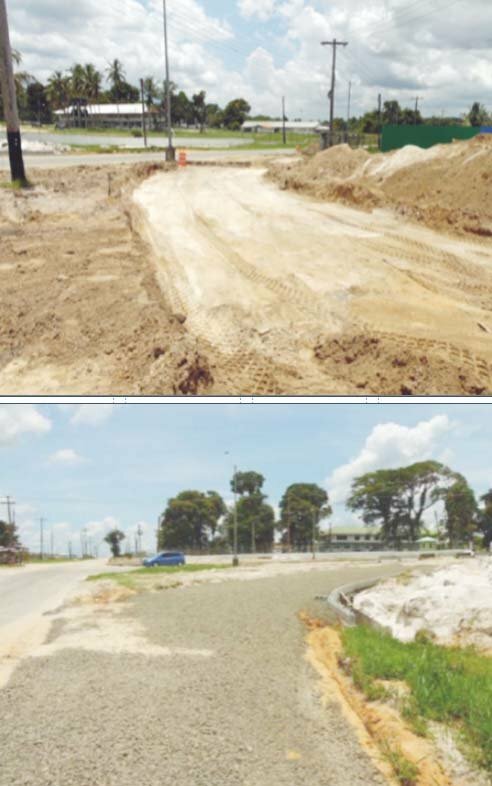 The construction of a roundabout at Timehri, East Bank Demerara, which should have been completed in 24 weeks, has been stalled for more than a year due to “complications” regarding the removal of Guyana Telephone and Telegraph Com-pany (GTT) and Guyana Water Incorporated (GWI) utilities that were present at the site. This is the explanation provided by the Ministry of Public Infrastructure, according to the 2017 Auditor General’s report, which was tabled last month in the National Assembly. The $74 million contract for the project was approved by the National Procurement and Tender Administration Board (NPTAB) on August 2nd, 2017, and records show that the contractor, Gaico Construction and General Services, was advanced just over 40% of the contract sum. According to the report, the contract was awarded to the second lowest of 11 bidders. The engineer’s estimate was $102.920 million. Amounts totalling $30.800 million were paid to the contractor, while the sum of $628,568 was paid to the GRA as 2% withholding tax, the report said. It added that under the contract the works comprised the construction of a single lane rural roundabout and bypass road at the intersection of the existing two-lane road coming from the Cheddi Jagan International Airport (CJIA) and the newly constructed four lane roadway. The ministry, in response to these findings, explained that the contract time had elapsed and the works were not completed due to the complication that arose with regards to the removal of utilities from the work area, namely GTT and GWI. “These issues arose and required an additional $8.5M to remove GTT utilities and $11.5M for GWI utilities,” the ministry said, before adding that those delays caused works to be stalled until June, 2018. Further, it was explained that the contractor was awaiting the removal of some light poles that the ministry should have removed by September 24th, 2018, before works could commence on the centre section of the roundabout. Stabroek News was unable to ascertain if those poles were removed. The ministry also said that due to the delay, the contract bonds have expired and that the contractor has been instructed to renew his bonds, which he is in the process of doing. The ministry added that based on the value of works, total payments were 19.2% of the contract sum. As a result, Auditor General Deodat Sharma recommended that the Head of Budget Agency ensures that copies of the order to commence/letter of commencement, performance bond and insurance for the works are submitted for audit examination and that the advance bond remains valid until the advance payment has been recovered. He called on the ministry to also clarify whether or not the contractor has been granted any extensions of time and confirm if there is a new scheduled completion date for the works. Any approved extensions of time with justifications should be submitted for audit examination, he said. In June this year, subject minister David Patterson had said at the official opening of the Kitty Roundabout, that the circular intersection at Timehri is one of two planned for Region Four. He did not say when it is expected to be completed. The other roundabout will be constructed at the Sheriff Street, East Coast Embankment Road junction and it is being done as part of the Sheriff Street-Mandela Avenue road upgrade and expansion project.